Full service printing is the basis of the Minuteman Press concept; a virtual one stop center for printing and graphic requirements around the world. History Minuteman Press International, Inc. is the world’s largest printing franchise. 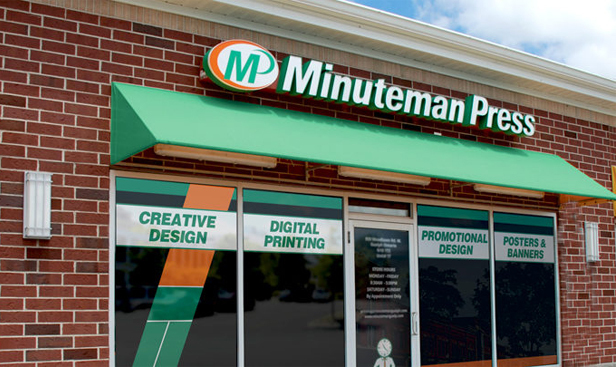 From it’s inception in 1973, Minuteman has carved a unique position in the printing industry and expanded on it to become the #1 rated franchise year after year. This success can be attributed to a hard work ethic both by the support staff and each one of the over 950 independent owners worldwide. Minuteman’s beginning was much more humble than its world renowned presence that exists today. Roy Titus, the founder, saw a need for a print shop that could serve virtually all print-related needs of a business. Being in the corporate world for years, he knew better than most the shortcomings of the instant print shops of the times. All businesses, large or small, from high-tech to your neighborhood shops, all use printed material in the daily operation of their business. Roy saw the magnitude of the industry, and the wide market base potential. Roy decided to take control of his destiny, not to mention the multi-billion dollar printing industry. The first Minuteman store was opened by Roy’s son, Bob, in Plainview, NY in 1973 and more followed shortly thereafter. Today his vision expands all over the globe. In 1995, we crossed the Atlantic and started opening locations in the United Kingdom. In 1996, we entered South Africa and in 1998 we entered Australia. Today, there are over 40 franchises in each of these three countries. These figures attest to not only our growth, but also the strength of our name! As a Minuteman Press owner, you will have a unique place in the printing industry, having the capability to serve virtually all the printing needs a business may be faced with. & Services When it comes to fast and professional printing and business communications services, Minuteman Press has got it covered. Our stores offer a wide variety of products and services designed to help you get your message out to customers, employees and vendors alike. Using the latest in printing and document management techniques, we provide you with fast and professional results for all your printed collateral from the first copy to the last. The experienced and helpful staff of your locally owned and operated Minuteman Press store is dedicated to delivering what you need when you need it. Investment Once you are accepted as a Minuteman Press franchisee, you may be eligible to finance the equipment package. While there are many advantages to this financing program, you are certainly entitled to select any independent financing program which best suits your needs. & Support The training center is a modern facility furnished with the latest equipment and staffed with experienced professional training personnel. This training provides the franchisee with technical knowledge about the business, as well as business knowledge pertaining to bookkeeping, pricing, management techniques and direct marketing techniques required to efficiently operate the business. After the initial training period, franchisees will have a Minuteman Press representative at the location to work with them in opening the new business, assist with hiring and training new employees, and to help in getting started. Minuteman Press offers exceptional support for franchises from our 25 regional backup and support offices; by extending technical and marketing assistance on a local level. Support personnel maintain a high level of communication and continually offer assistance to franchise owners. Regional meetings and conventions are also held to further educate owners to innovations and new trends in the industry. Additionally, Minuteman Press has been committed to constantly improving and refining procedures with items such as computerized pricing, e-commerce solutions and our propriety management software, seeking ways to better assist franchise owners to grow their business. etc. Imagine a business with every other business as your potential customer, and you have just imagined our printing business. All businesses, large or small, from high tech to your neighborhood shops, all use printed matter in the daily operation of their business. We are sure that you can see the magnitude of the industry and the wide market base we serve. As a Minuteman Press owner, you will have a unique place in the printing industry, having the capability to serve virtually all the printing needs a business may be faced with. In addition, you will find our business to be a creative one; challenging and exciting, a business that will allow you to test all of your abilities and potential. You will own your business but be secure and have peace of mind knowing that we have the experience and are available to assist, educate, guide, and work with you on an ongoing basis in developing your business. Contact Minuteman Press International, Inc.